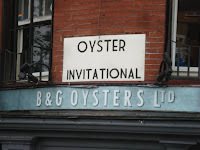 My wife and I arrived at the B&G Oyster Invitational at noon on Saturday. Only a handful of others arrived at the official start time so we were fortunate to have plenty of space, oysters, drink and passed appetizers almost to ourselves for 30 minutes. We camped out in front of the boat of oysters on ice being shucked by Island Creek Oysters. Shore, CJ, Erin, and Berg were decked out in Island Creek apparel and were shucking at an impressive rate. Next to them were the Harpoon Brewery and Matunuck Oyster Farm from Rhode Island. Also in the area was a wine bar set up by Cat Silirie who handpicked a few great options to accompany the oysters. When I thought the day couldn’t get any better the passed appetizers started emerging from the kitchen. I sampled B&G's lobster rolls, calamari, lobster bisque, fried oysters and baked oysters. By 12:30 PM I was buzzed, full and happy as could be. 12:30 PM arrived and Rachel and I walked across the street to Stir for an intimate class called, "Discovering Your Oyster Profile." The staff, Mark and Heather, educated 10 of us on Wine Director Cat Silirie's suggested wine pairing for the oysters, a 2007 Pepiere Muscadet Sevre et Maine Clos des Briords. 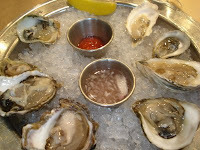 We were then presented with a variety of east and west coast oysters. We learned about each oyster, sampled it and then discussed the taste. I missed some of the discussion because I was busy eating Rachel’s oysters in addition to mine. Rachel is pregnant and is not eating raw oysters nor drinking alcohol for the meantime. This doesn’t stop her from attending oyster festivals and classes with me, and that’s just another thing I love about her. She’s also been my designated driver which came in handy after the festival. Observing the class before his book signing was Rowan Jacobsen, author of The Geography of Oysters. It was a pleasure to meet him in person because his book is one of the best and I have given it as a gift to people and I have received rave reviews from them. 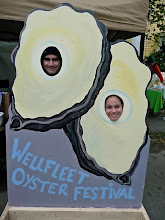 After the Stir class we went back to the Oyster Festival. At 1:15 PM it was crowded. Fortunately it was not overcrowded but it wasn’t just a few of us in the room anymore. After a few more oysters and Harpoon IPA we found Andrew Jay of the Massachusetts Oyster Project and Alyson from Shuck-Off. What great people! I’ve been following the work of the Mass Oyster Project and it was fun to put a face to the man behind the great work. Out in front of B&G on the sidewalk of Tremont Street, there was a table set up by Woodbury Shellfish out of Wellfleet, MA. They were giving samples of the most delectable littlenecks, raw of course! The owners were great to talk to, and even gave some tips on opening the littleneck, which I generally break the shell. Here is link to opening techniques they share. Before we left the festival we sampled the hot dogs being grilled by The Butcher Shop and had a few sightings of famous people including Eli Feldman from No. 9 Park, William "Chopper" Young, and of course Cat Silirie and Rowan Jacobsen. Barbara Lynch has to be proud of her accomplishments: No 9 Park, B&G Oysters, The Butcher Shop, Stir and the Oyster Festival, to name a few, are all incredible experiences. With a visit to Boston, you must indulge at one of her restaurants. Better yet, save your visit for next year's B&G Oyster Festival and arrive early.